Both the groups followed the above-mentioned exercise protocol for 5 days/week for 3 months. Visual analog scale (VAS) for pain and the Western Ontario and McMaster Universities OA Index (WOMAC) score were noted pre- and post-intervention. The therapist who supervised the intervention and outcome assessor was blinded to the groups. Hence, the study was double-blinded. Detailed study layout was displayed in the standardized format, consolidated standards of reporting trials [Figure 1]. A total of 40 female PKOA were recruited for this experimental study. The demographic characteristic of the patient recruited was given in [Table 1]. 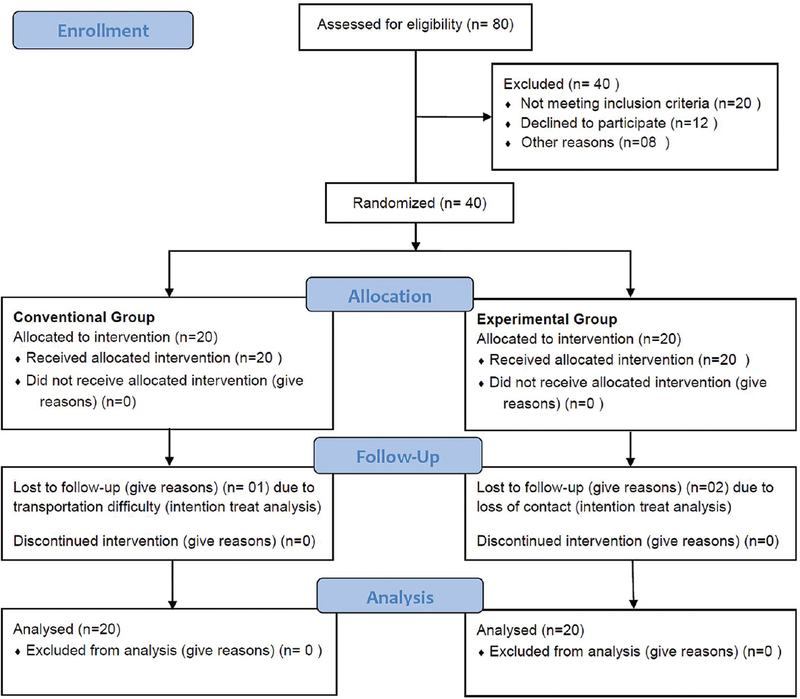 Three PKOA (one – Group A and two – Group B) who lost to follow-up were analyzed using intention to treat analysis. 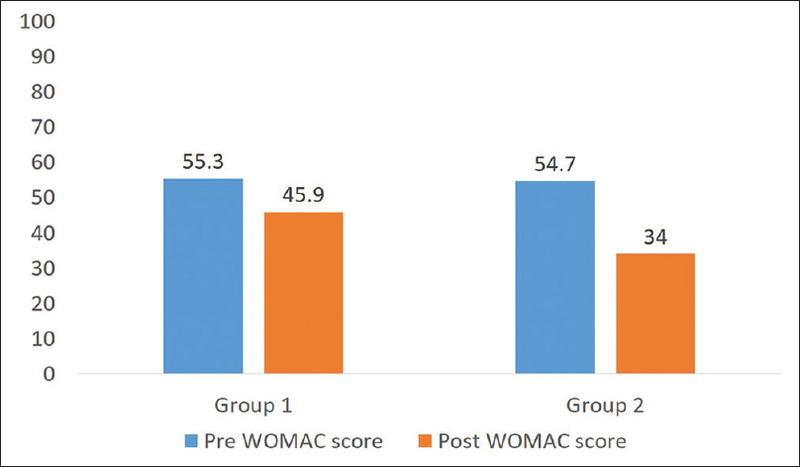 There exists significant difference between pretest and posttest in VAS and WOMAC scores among both the groups, which are displayed in [Table 2] and [Table 3]. Between group analysis revealed significant difference among the groups. 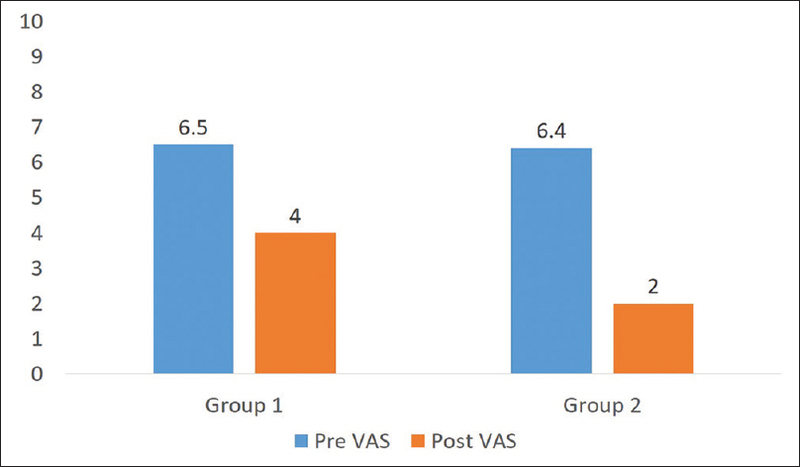 PKOA in Group B demonstrated significant improvement (P < 0.001) in VAS and WOMAC scores when compared with Group A, [Figure 1], [Figure 2], [Figure 3]. Pal CP, Singh P, Chaturvedi S, Pruthi KK, Vij A. Epidemiology of knee osteoarthritis in India and related factors. Indian J Orthop 2016;50:518-22. Sun HB. Mechanical loading, cartilage degradation, and arthritis. Ann N Y Acad Sci 2010;1211:37-50. Sellam J, Berenbaum F. The role of synovitis in pathophysiology and clinical symptoms of osteoarthritis. Nat Rev Rheumatol 2010;6:625-35. Felson DT, Gross KD, Nevitt MC, Yang M, Lane NE, Torner JC, et al. The effects of impaired joint position sense on the development and progression of pain and structural damage in knee osteoarthritis. Arthritis Rheum 2009;61:1070-6. Sekir U, Gür H. A multi-station proprioceptive exercise program in patients with bilateral knee osteoarthrosis: Functional capacity, pain and sensoriomotor function. A randomized controlled trial. J Sports Sci Med 2005;4:590-603. Pinto D, Robertson MC, Abbott JH, Hansen P, Campbell AJ, MOA Trial Team. et al. Manual therapy, exercise therapy, or both, in addition to usual care, for osteoarthritis of the hip or knee 2: Economic evaluation alongside a randomized controlled trial. Osteoarthritis Cartilage 2013;21:1504-13. Nam CW, Kim K, Lee HY. The influence of exercise on an unstable surface on the physical function and muscle strength of patients with osteoarthritis of the knee. J Phys Ther Sci 2014;26:1609-12. Knobloch K, Martin-Schmitt S, Gösling T, Jagodzinski M, Zeichen J, Krettek C, et al. Prospective proprioceptive and coordinative training for injury reduction in elite female soccer. Sportverletz Sportschaden 2005;19:123-9. Kramer M, Hohl K, Bockholt U, Schneider F, Dehner C. Training effects of combined resistance and proprioceptive neck muscle exercising. J Back Musculoskelet Rehabil 2013;26:189-97.